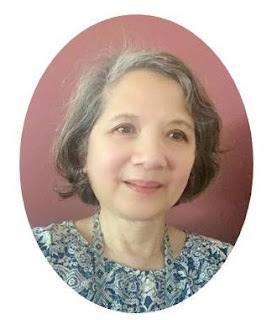 Remember my recent review of Pru McRae's Kumihimo Endings book? I did say back then that she has another book. 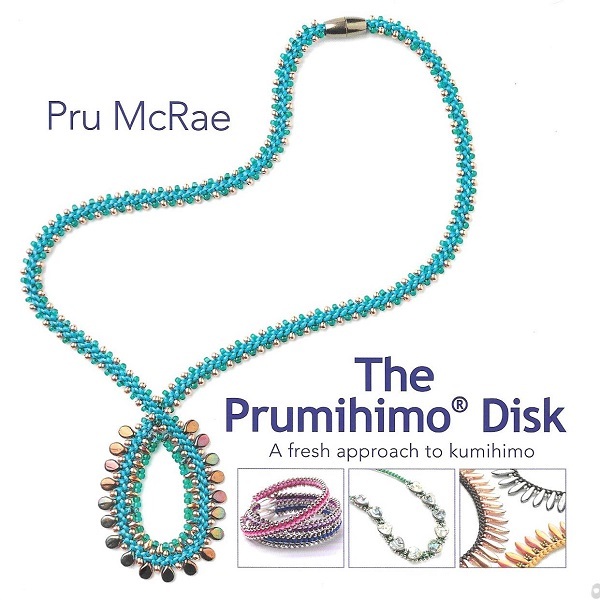 This one, The Prumihimo Disk book really shows how good Pru is with kumihimo. This innovative designer developed a different kind of disk which allows the user to easily place beads on the outside of the braid. Like her previous book, this one is also small and thus highly portable. The Prumihimo disk is slightly smaller than a typical kumihimo disc. It is sized so that most users can reach the middle hole with their thumbs. It is different from the latter in many ways. Firstly, the disk is actually octagonal, not round. There are far fewer notches as Pru has eliminated unnecessary ones. There are also just 4 numbers which help orientate users as they work in an anticlockwise fashion. Pru uses 8 cords which is similar to the popular 8 cord method but the cords are positioned in an evenly spaced spoke like fashion. Otherwise, the motion of moving top cord down and bottom cord is familiar. All in all, her disk and method really simplifies kumihimo. Her disc uses 2 sizes of cords - less is used than in regular kumihimo. 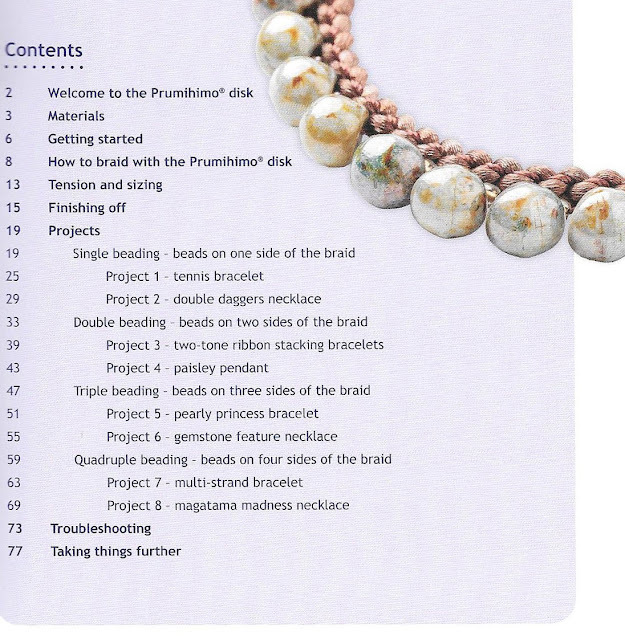 Her book is divided into 4 main categories depending on how sides of the braid will have beads. 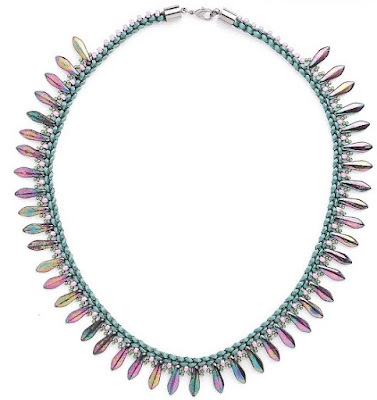 This double holed dagger necklace has the beads placed only on one side. I love how Pru added beadwoven beads in between the dagger beads to enhance the design. 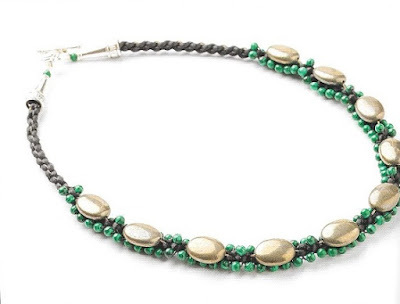 This fun necklace project has the beads on two opposing sides of the braid. 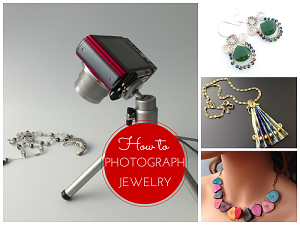 She varied the types of beads for the focal loop. This three sided bead project uses much larger gemstones on one side. A really novel look as the gemstones look like they are floating! 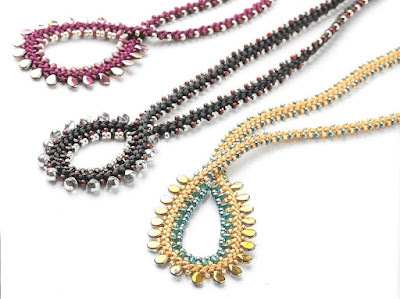 Quadruple beading has beads on all four sides. The magatama necklace shown here looks rather like the ones created with the regular disks but uses far less beads. The Prumihimo disk is not just a new way of working with beads in kumihimo. It is a well thought out design which is easier to understand and do. 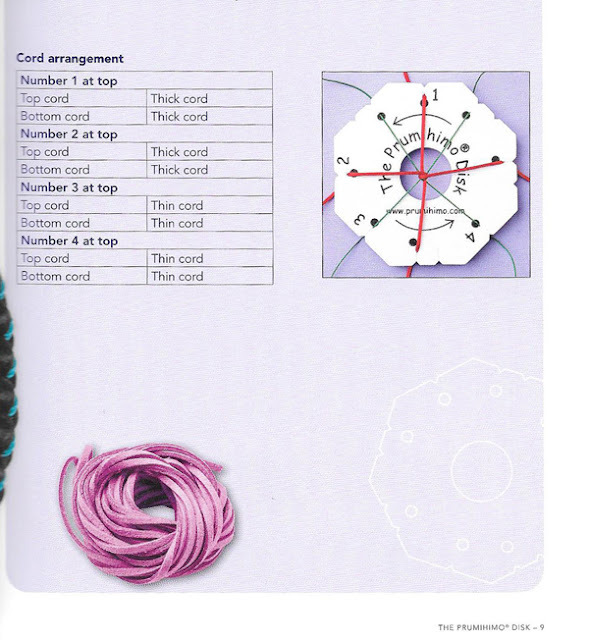 Pru has the book, disc and tutorials over on her site, Prumihimo. If you'd like to win this giveaway for a copy of Pru's book AND the disk, please make a comment below. 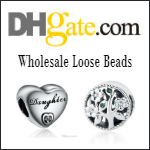 Make sure you leave contact info below if you do not have an online shop or blog. It ends in a week's time at 6 pm EST Monday, April 22, 2019. I will pick the winner randomly and announce the results as soon as possible after. So be sure to leave a contact email if you don't have an online link or make sure you come back and check! Otherwise I will redraw in a week. Good luck! Ohh, I have always wanted to try Kumihimo. It looks fun but confusing. I think this simplified disk would make it easy. I would love to win! Ooh, that book and disk look amazing. Thanks for telling us about them. I'd love to win. Ooh, that book and disk look amazing. Thanks for telling us about them. I'd love to win. I just tweeted about the contest too. I am so excited I love Kumihimo my teachers were Rebecca Combs and Pru this is a new method I wold love to learn I hope I can be picked. Oh my! I already love making Kumihimo jewelry. I watch a lot of Pru’s videos, and her prumihimo disk is very intriguing as I only have the regular one, at the moment. 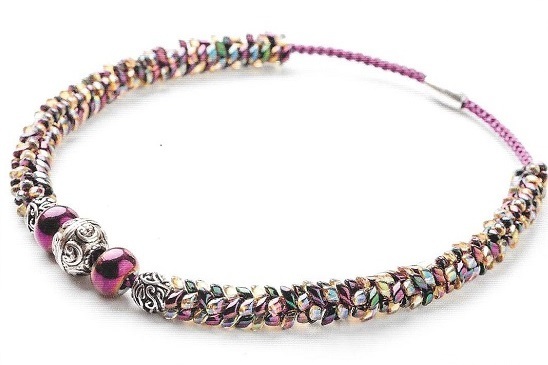 Edge beads make such beautiful pieces. I would really like to have the opportunity to give this a try. I've had Pru's book for a while now and think it is a great new concept. 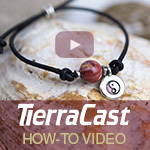 I recommend it to anyone who wants to learn a new and innovative method. The results of her method are stunning and quite nice to wear. The only complaint I have is that, unless things have changed, she ships them from Britain. 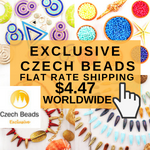 They aren't inexpensive and when you add international postage, the can become a little pricey. Having said that, they are worth the money and you won't regret having the book and the disk. Ooh, this technique looks so nifty, and I immediately thought of a dozen designs of mine that could be improved with Prumihimo. I would love to win this! I have tried kumihimo in the past and it was too confusing for me. This looks easier. Perhaps a little success with adding beads would get me going again. This sounds like so much fun to learn and try. I have not yet tried my hand at kumihimo. That piece is absolutely gorgeous! I would love to win! I’m a blog subscriber and FB follower. 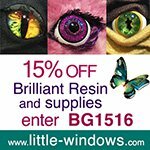 I have been a blog subscriber for over 20 years and I would love to win this set. 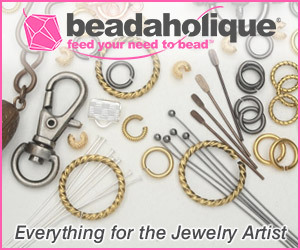 I would love to try kumihimo with beads, especially these new beads that Pru uses. I love her designs. Wow! This looks like fun. Pick me, please! How inventive! I would love to try this method, it looks like it would be quicker and makes more interesting designs! I would love to learn how to make these thanks for the chance to win. This seems like a great way to get started with kumihimo (I have some of the more complicated disks but they are a bit daunting for a total beginner like me). I love Kumihimo and most of all, Pru's work. Thank you for a chance to win this giveaway. Count me in! I love kumihimo and I really love how this disc seems to simplify the process and the way beads can be added in a multitude of ways! This sounds great. Just tweeted again. I'm fairly new to beading but have fallen deeply in love with the craft. I'm increasing my inventory little by little and increasing my skill as I do. 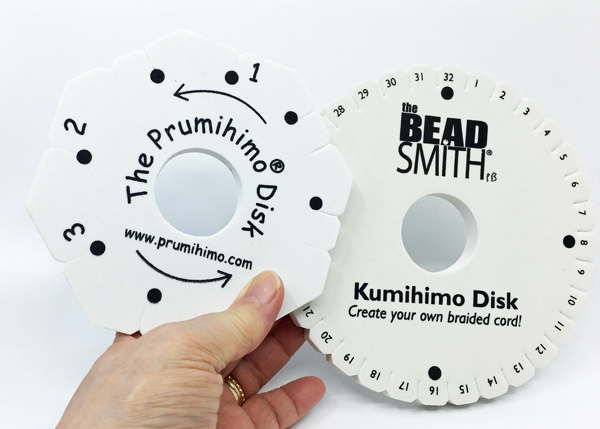 I've watched a few Kumihimo videos and would love to give it a try with the Prumihimo disk. I liked your Facebook page and clicked See First so I don't miss any posts. I also followed you on Twitter and Pinterest and subscribed on YouTube. My email is maggiehall@hotmail.com Thank you for such a nice giveaway! I love Kumihimo but have never tried her disc or techniques. I would love the opportunity to do so. Thank you for another great review! I have been contemplating purchasing this book, so I would truly love to win it. I believe Pru is a very talented and generous lady with all she does to promote our beading hobby/business. I haven't done either kinds and would love to try. I really like that it's simplified and seems easier to use. I also like that the beads are showcased on the outside of the work. I have tried beaded kumihimo and failed miserably. This new disk sounds alot easier. I really enjoy the kumihimo technique because you can take it anywhere and not worry about beads falling off your lap. I love the rope designs and want to learn to use beads with it. I would love to win this book! I love her designs. Would love to learn how to do some of this. One last time. This looks so great.